Large, usually solitary but occasionally 3 in an umbel. Reaches its maximum development in well-drained soil in sheltered valleys. Frost hardiness depends on provenance. Even seedlings from cold areas will be frost susceptible when young.Timber is valuable for wharf and bridge construction , for piles and for telegraph poles. Useful for control of erosion and to provide soil stabilization. Provides dense shade. Important source of food for the swift parrot, but the large size and its limb shedding vice makes it unsuitable for gardens, parks or school ground; larger properties only. 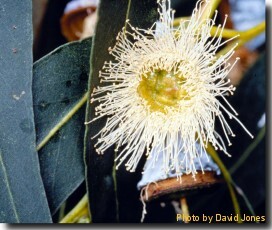 Information on propagation also applies to all ssp of Eucalyptus globulus. Not suitable below powerlines. *Dry stored in refrigerator at 3-5oC.